Oh boy, this is a topic I was actually kind of avoiding. I have a lot to say, but not quite sure how I will deliver it. So, here it goes.. I have been single for quite some time. I’ve dated within these past 4 years, one that was quite on the serious side, but not quite the right time. Wink to you if you’re reading this. On my instagram I recently shared a post about being single. See below. This came to me today. It was a WISDOM ah ha moment. I say a wisdom ah ha moment because I’ve know this very thing for quite some time. In fact I thought I was ready to be someone’s wife, but I was quite far gone from even being close. I had some underlying issues which caused some issues in the relationship I was in with someone. We call those issues, baggage. We were doing pretty good, but things came up in the relations that triggered past hurt which caused me to shut down. If I had been honest with myself and healed from the things I said I did, I may possibly be married right now. Now, before I keep going I am not taking full owner ship over here. I am simply acknowledging my errors. I also thought that I was a great a communicator. My failed (relationships) proved that was a lie. Friendships, courtship, family ships, I mean my ships failed. They failed Because I did not communicate accordingly. So it came to a point where I was like, what the heck is going on?! I mean yes everything is in God’s timing, only, BUT ONLY if you are ready. Some of you reading this may have asked yourself the same question. Why am I still single? Why am I not friends with this individual? Why do I see a pattern. Well let me answer it. It’s you. YOU MUST take OWNERSHIP of your OWN ACTIONS. You have to work on yourself ladies, and possibly genetlemen. Some of you reading this have children. Some of you want your children to have successful relationships. But how can you want something beautiful for someone else if you, yourself are not willing to put in the work to attain that? I mean, what kind of model are you? (Trust me, I am speaking to myself as well) Now Let me share with you some of my struggles. Some of which I still battle with today. Confidence: ladies, have you ever found a nice outfit, great shoes and your hair is just right to fit the outfit, Don’t you feel extra beautiful because YOU put something together that helps exudes the beauty within yourself? And all of that took your action. How about releasing some of the weight you had been wanting to get rid of for quite some time. I say release because you if you lose it, you might find it again. I heard that from “Lisa Nichols” . You actually find yourself working out, eating right, feeling right, and your entire mood is on cloud nine. It’s so HIGH people notice it and your getting compliments from left to right. It’s not the outfit, it’s not the weight. IT’S YOU. You have to believe that you are beautiful. You have to know that if a man is lusting or loving on another woman that isn’t you, then he isn’t for you. So with that said, because I felt my fingers going off at a mile a minute, indicating that I can go on and on, on this particular topic, I say , do what that photo says above. 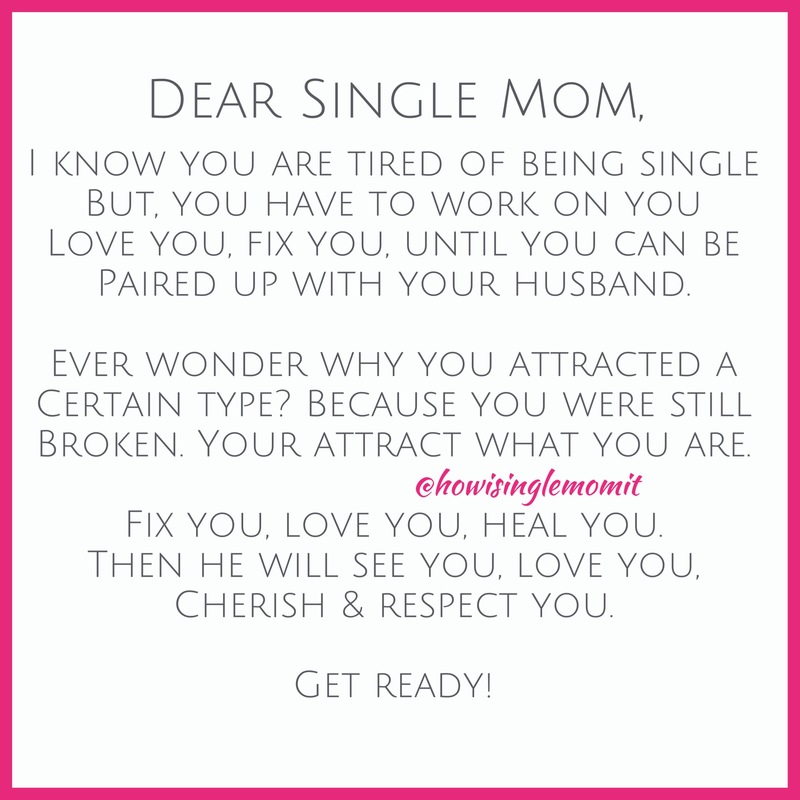 Work on you, love on you, work on the things you know, will not be attracted to the husband you envisioned. The husband that is merely waiting for you, the husband that he too is preparing for you. Let me tell you something ladies. Men, they LOVE a confident woman. A woman who knows she is beautiful inside and out, and is open to receive love. Broken people attract broken people. So if you still getting the same kind of men, then you have to change you..
And if someone didn’t tell you today, I will. → Do you LOVE yourself?